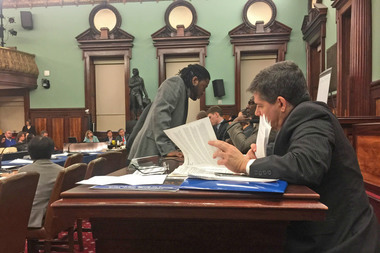 Councilman Jumaane Williams, left, consults with a colleague, while Councilman Vincent Gentile looks through paperwork at the City Council hearing on the mayor's controversial rezoning. NEW YORK CITY — Mayor Bill de Blasio's rezoning proposals were easily passed by two City Council committees Thursday — but not before some lawmakers expressed concerns that one of the plans will keep New York City one of the most segregated cities in the nation. The City Council's Zoning and Franchises Subcommittee and its Committee on Land Use both overwhelmingly approved Mandatory Inclusionary Housing, a zoning change to require some new construction to include a certain amount of permanently affordable housing, and Zoning for Quality and Affordability, which increases building heights and lifts parking requirements to spur construction of affordable and senior housing. The two proposals are part of the mayor's plan to create or preserve 200,000 units of affordable housing by 2024. The approvals come after the Council negotiated changes to both proposals with the mayor to deepen the level of affordability on MIH and modify some of the parking requirements based on the transit access in ZQA. "We cannot please everyone but we are confident that the modifications we vote on today will improve the proposals," said Queens Councilman Donovan Richards, chair of the subcommittee. But Brooklyn Councilman Jumaane Williams and Bronx Councilman Ritchie Torres raised concerns that the affordability requirements in MIH did not go far enough to end New York City's status as one of the most segregated cities in America. A study from the University of Michigan found that the New York metropolitan region had the second highest rate of Black-White segregation and the third highest rate of Latino-White segregation. Under MIH, the City Council member whose district a development is in chooses from several options, mandating different percentages of permanent affordable housing for people making anywhere from 40 percent of area median income, or AMI, to 115 percent. ► READ MORE: WHAT IS AMI? But Williams said a certain percentage of lower income housing should have been unequivocally mandated in each of the four options. "I believe as we move forward we have to break up the segregated communities that are in this city and the only way to do that, I believe, is to mandate certain things," he said. The lower income options are "for those elected officials and those communities who welcome low income units. It does not mandate those elected officials and communities that historically have not welcomed low income communities," he added. One option proposed by de Blasio and left intact by the City Council allows developers to meet the requirement by making 30 percent of housing affordable for those who make 80 percent of AMI. That amounts to a yearly income of $62,000 for a family of three and a monthly rent of $1,550 for a two-bedroom apartment. "The notion that you could rezone a whole neighborhood without creating a single unit below 80 percent of AMI, the fact that that's even a theoretical possibility, is deeply alarming to me," said Torres. "I believe every neighborhood should have a broad mix of incomes." Williams voted no on MIH, making him the only subcommittee member to come out against either plan. At the committee level, the votes were 15-2-1 on both bills, with Williams again voting no on MIH, Bronx Councilman Andy Cohen voted no on ZQA, Brooklyn Councilwoman Inez Barron voting no on both, and Manhattan Councilwoman Rosie Mendez abstaining on both. ZQA had been opposed by preservationists and community groups in neighborhoods with historic and contextual districts, where vocal locals secured specific height limits over the past few decades to keep new construction in line with the neighborhood's "character." Richards said the mayor's plan "went too far in some areas" and the height increases were "not justified given their potential effects" on neighborhood character, and "not linked to policy goals." That's why, he said, the Council killed the height increases for market-rate housing in the Manhattan Core — below 110th Street — and tweaked other changes to zoning particulars, like setbacks, rear yards and shallow lots. "These changes protect neighborhood character and still provide light and air," while meeting affordable housing goals, he said. But all Council members were emphatic about the importance of providing senior housing, and Richards made note in particular of the compromise in giving up parking for that housing. Senior housing advocates say there are at least 200,000 seniors on wait lists for housing in New York City, and that most of the parking lots that were required to be built with new senior housing are empty.